Studies show more woman than men took up hunting in the United States in recent years, according to figures from the National Sporting Good Association’s 2010 Shooting Sports Participation report. In the hunting world, Haley Heath has been labeled as a top hunter in the industry. As a 5th generation hunter, Haley is now the host of the popular program Family Traditions with Haley Heath on the Sportsman Channel. She has been the Outdoor Channel’s first woman to receive the "Viewer Favorite" Award. Haley epitomizes today’s generation of hunters and how a growing number of women are participating in the worlds oldest tradition. When collaborating with Haley regarding a line of female specific hunting knives, she revealed her favorite hunting knives are Buck's ErgoHunters, in which she'd like to see that line redesigned for the female touch. 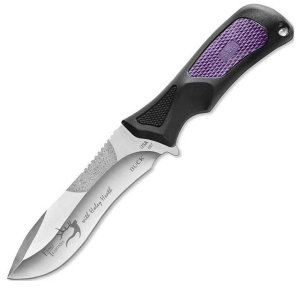 With a modified handle designed to fit in smaller hands, and finger guard for a safer grip, Buck has provided just the knife Haley trusts to serve her hunting needs. Other safety points are designed into this knife, such a machined checker pattern all-weather grip on the handle and EDM texture on the blade for added control. The reliable, full tang skinning blade is durable and sized right for smaller hands to field dress big game.